Wholesale orchids . . .
From colorful cymbidiums . . .
. . . dendrobiums and phanaelopsis . . .
. . . to rare and exotic varieties . . .
. . . we have them available to you, the retailer or wholesaler, at Bay Breeze Greenhouse. 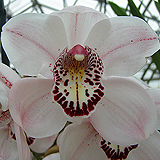 Bay Breeze Greenhouse is your source for hard-to-find orchids. We're small enough to stock varieties you wont find in larger operations, but large enough to supply almost any merchant with in-demand orchids. Were located off Monterey Bay in Californias Salinas Valley, where ocean breezes create an ideal setting for cool-climate orchids. 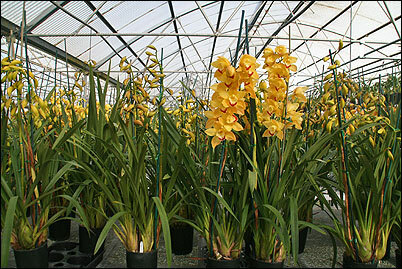 And our temperature-controlled greenhouses create the perfect environment for warmer climate orchids. 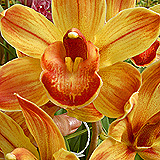 Come on a stroll through this site – our virtual orchid greenhouse. We'll give you a tour, and show you some of our flowers . . .
. . . from our many varieties of orchids to our non-orchid flowers, such as Tacca Chantrieri (Bat Plant) and Dischidia Pectinoides. Retailers, if you're in the Monterey Bay area, visit us -- and our flowers -- at our greenhouse. Were located at 145 Zabala Road, in the farmland just south of Salinas. And while youre in the area, dont miss out on those great Monterey County wines  especially the chardonnays and pinot noirs. And be sure to set aside some time to enjoy the rugged, spectacular Big Sur coast, and Monterey Peninsulas Cannery Row and Carmel. 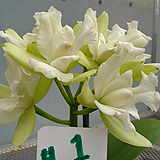 To order some of our colorful, lovingly-grown orchids, e-mail us at yoriko0920@gmail.com, or call us at (831) 422-8755. We ship our flowers to retailers across the U.S. Please keep in mind that we're a wholesale nursery. 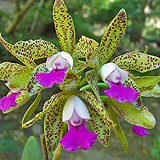 Our sales are limited to orchid merchants and others in the trade. 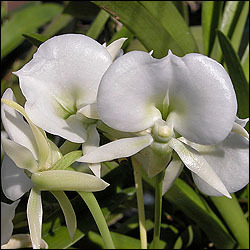 But if you're an orchid hobbyist, by all means please mention us to your orchid retailer or favorite nursery. We ship our orchids to retailers across the U.S.
Read on -- and enjoy! Choice orchids at a family-owned wholesale greenhouse in Monterey wine country. Enjoy the world of color in our greenhouses. Copyright © 2011 Bay Breeze Greenhouse and John Viljoen. All rights reserved.